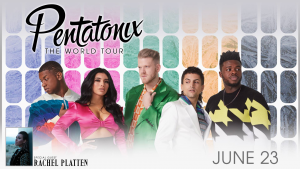 Resch Center – Sunday, June 23, 7:30 p.m.
Green Bay (February 7, 2019) – Three-time Grammy Award-winning and multi-platinum-selling artist Pentatonix have announced a 45-date tour produced by Live Nation to kick off their World Tour. Emmy Award-winning, multi-platinum-selling recording artist Rachel Platten will join as special guest on all dates. Pentatonix will be at the Resch Center on Sunday, June 23, 7:30 p.m.
Tickets for the tour will be available via a Patreon member presale running from Monday, February 11 at 10 a.m. until Thursday, February 14 at 10 p.m. American Express® Card Members can purchase tickets in select markets before the general public beginning Tuesday, February 12 at 10 a.m. through Thursday, February 14 at 10 p.m.
Tickets begin at $20 and go on sale Friday, February 15 at Noon at ReschCenter.com, by phone at 800.895.0071 or at the Ticket Star Box Office in the Resch Center.